HomeAn Alarming New Lump or Bump on Your Pet? An Alarming New Lump or Bump on Your Pet? Let’s say you’re giving your dog a nice massage or a bath, and as you run your hands over his body, you suddenly feel a strange lump under his skin. Random lumps and bumps are so common in dogs that this scenario plays out every day all over the world, but it’s still alarming when it happens to you and your dog. Especially as dogs age, they can develop harmless growths beneath the skin, many of which turn out to be fatty tumors, or lipomas. Lipomas are benign fatty masses enclosed in a thin capsule, and they’re the most common type of noncancerous soft tissue growth in dogs. Any dog, regardless of breed, gender or age, can develop a lipoma (or several). Fatty tumors in dogs typically develop just beneath the skin’s surface on the neck, upper legs, underarms or torso. However, they can occur anywhere on the body, including in muscle tissue. If the lipoma is under the skin, it will have a soft, squishy feel and you’ll be able to move it around. If it’s in muscle tissue, it may feel very firm. It’s true that any dog can develop a fatty tumor — young, old, spayed, neutered, obese or thin. However, in my experience there’s a link between the number and size of lipomas on a dog, his ability to metabolize fat and his overall vitality. If a dog doesn’t have a vibrant, thriving metabolism, what tends to happen is he accumulates fat in what I call “glumps.” When you or I gain weight, we tend to gain it in several places on our bodies. When a dog with inappropriate fat metabolism gains weight, he adds glumps of fat in one spot. These are lipomas, or benign fatty masses. Certain breeds tend to acquire more lipomas than others, including Labrador and Golden Retrievers, making many vets wonder about a possible epigenetic component to the formation of these benign masses. Some holistic and integrative veterinarians also believe lipomas and other fatty tumors are a sign that a dog’s body is not able to effectively eliminate toxins via processes involving the liver, kidneys, and intestines. And according to Traditional Chinese Medicine (TCM) principles, lipomas are a manifestation of “stagnant Qi,” or “phlegm” (an “energetic blockage” that eventually manifests in a physical, benign mass). Regardless of how or why lipomas occur, it’s important to know they are usually nothing to fear, but do require monitoring. 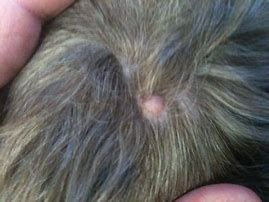 Many veterinarians recommend removal of every lump, bump and skin tag, but many of us in the integrative veterinary community prefer to leave confirmed benign lumps (like lipomas) alone unless they are seriously interfering with a dog’s mobility or quality of life. When you bring your dog in for a suspicious lump, your veterinarian should perform a fine needle aspirate to determine whether the mass is something to worry about or simply a benign lipoma. If it comes back as a harmless fatty mass, it should be noted on your dog’s body chart, including its size and the date. Then it can be watched for any changes in size, shape or appearance. If your dog’s lipoma grows in size, depending on its location it may be medically necessary to remove it before it’s big enough to impinge on his quality of life. This would include, for example, a growing lipoma in the armpit that’s changing the dog’s gait, or one on the sternum that rubs against the carpet every time he lays down, causing skin abrasions. Some lipomas remain the same size throughout a dog’s life. They’re nothing to worry about, and it’s only necessary to watch them for growth or any sort of change. Bottom line: I very rarely surgically remove lipomas except in situations where the lump is affecting range of motion or the dog’s gait or comfort level. If the dog’s quality of life is suffering, if she’s no longer walking comfortably, if there’s ribcage rotation or if she’s compensating in ways that are causing skeletal problems, often removing the lipoma will dramatically improve her musculoskeletal health. In those cases, it’s best to remove the mass sooner rather than later, because the bigger the lump, the bigger the incision. Surgical removal of a lipoma is called debulking surgery. Debulking means we remove the majority of the mass, but not all of it. Benign fatty tumors are frustrating to deal with because while we can remove all the visible fat, there are always (and I do mean always) fat cells that remain. They can be in the fascia, slipped down into the musculature or on the underside of the skin. Those fat cells have a memory, and unfortunately, lipomas can reform. We call the procedure debulking because we can’t promise we’ll completely remove all the fat cells or that the lipoma won’t reappear in the same location. However, despite the tendency of lipomas to regrow in the same spot, you should still consider removal under certain circumstances. To give your canine companion the best chance to avoid fatty tumors, it’s important to keep her in good physical condition while also supporting her metabolism, immune and lymphatic systems, and organs of detoxification. Do at-home physical exams very consistently. The more comfortable you are with knowing what’s normal, when it comes to being in touch with every inch of your dog’s external terrain, the sooner you will know when something is changing, like a fat glump starting. Massaging tiny accumulations of fat, early on, can help dissipate these annoying masses from gaining momentum and becoming a problem down the road. If you’re feeding a processed diet, your pet is getting a dose of chemical additives and carcinogenic byproducts like heterocyclic amines and acrylamides with every bite. And keep in mind that grain-free kibble has just as many synthetic nutrients and usually a higher glycemic index than regular kibble, so pets eating grain-free food are really no better off when it comes to dietary stress. Feed a whole, fresh, organic, non-GMO, nutritionally balanced and species-appropriate diet to reduce metabolic stress. Pet food in its natural state provides needed moisture and ensures the highest level of biologic assimilation and digestion. Provide clean, pure and high-quality drinking water. Your pet’s drinking water shouldn’t contain fluoride, chlorine, heavy metals or other contaminants. I recommend filtering not only your pet’s drinking water, but also yours; however, I don’t recommend alkaline water for pets. Be mindful of your dog’s BMI (body mass index) and body condition score. Pets can be thin and under-muscled, as well as overweight/obese. Thin dogs who don’t get daily exercise can also develop lipomas. Regular exercise provides your dog with countless benefits, including promoting regular elimination. Exercise also stimulates blood circulation and the lymphatic system, so toxins are moved efficiently to the liver and kidneys for processing. Physical activity also improves respiration and helps your pet eliminate mucus from the respiratory tract. Forbid smoking in your home, and use only nontoxic cleaning products. Consider investing in an air purifier to control dust mites. Avoid polluting your pet’s indoor air quality with perfumes, air fresheners and scented plug-ins or candles. These products are heavily laden with chemicals and are known to cause or worsen respiratory conditions like asthma in both people and pets. Toxins in the air also come from the off-gassing of chemicals from new synthetic household items like flooring, carpeting, furniture, drapes and even pet beds. Unless you’re providing an organic pet bed made without chemicals that specifically states it contains all-natural fibers and hasn’t been chemically treated, you should assume it has been treated with flame retardants. Consider periodic detoxification for your dog. We all try to reduce toxin exposure in our pet’s environment, but it’s nearly impossible to avoid all sources of exposure, so providing an occasional detoxification protocol for your pet can be very beneficial. Circulation-enhancing therapies such as massage and chiropractic treatments also assist in detoxification. Adding a tablespoon of raw, unfiltered apple cider vinegar for every 20 pounds of weight to your dog’s food each day may also help prevent fat from accumulating over time. Don’t allow your dog to be over-vaccinated or overmedicated. This includes avoiding all unnecessary vaccines, veterinary drugs (e.g., antibiotics and steroids) and chemical flea/tick preventives. You want to ensure your four-legged family member is protected against disease, but overdoing vaccines, chemical preventives and other types of drugs can dramatically increase the level of toxicity in the body.